The AIIEA began its eventful journey way back in July 1951. Since then it has moved on for over six decades now. The journey has not only been long, it has also been arduous. The AIIEA nonetheless weathered the storm that came its way and moved on, and in fact has been moving on undeterred, uninhibited, undaunted, intrepid and indomitable. In spite of being long and arduous, the journey has been exhilarating without an iota of doubt. Looking at the chequered history of this organisation, one feels tempted at times to indulge in a sense of megalomania. Often times we would say – ours is a Great organisation! A common refrain of many of our comrades is – AIIEA is a unique organisation! Our comrades are fond of saying with justifiable pride that AIIEA knows no defeats; victory after victory in the face of seemingly insurmountable odds is its hallmark! AIIEA is indeed great and unique. AIIEA is not a mere bread and butter organisation. Born in the immediate aftermath of India’s independence from colonial rule, its focus has always remained on the larger issues of the country and the people. Its arena of struggle has always been larger than the confines of the insurance industry. AIIEA is great and unique because of this vision. The stalwart of insurance employees’ movement Com.N.M.Sundaram would often say “AIIEA is the name of that perennial stream which constantly irrigates your consciousness”. A constant effort has always been made to broaden the horizon of understanding of insurance employees. Insurance employees have been constantly told right from the birth of AIIEA that no lasting solution could be found to their problems or for any other sections of the working people within the confines of the present rotten and decadent society. Whatever little relief one gets is only temporary and transient. A permanent and lasting solution to the problems of the working people can only be found by changing the exploitative order of the society. AIIEA has always implored insurance employees to contribute in whatever measure they can to the struggle for social change apart from their own struggle to secure and protect their own rights. A deep rooted social commitment and indomitable spirit for struggle are probably the basic elements of AIIEA’s vision. With an abiding commitment to the philosophy of the working class AIIEA has an uncanny knack of foreseeing events, an ability to look into the future, an ability to see the dangers on the horizon before they strike at our roots, analyse the upcoming challenges dispassionately in all their social, political and economic ramifications and then evolve the correct tactical line to jump onto struggle. The AIIEA is adept at making correct political and ideological decisions and then framing its response accordingly. This again is possible because of the correct understanding of the class character of the government and proper drawing of lessons from ground realities. To be precise, this is possible because of AIIEA’s ‘concrete analysis of concrete situations’. In the words of Com. N.M. Sundaram, “As AIIEA looks at the sky, it does not allow its feet to slip”. This is the beauty of the AIIEA’s vision. Trade unions can be either Reformist or Revolutionary. A reformist trade union only believes in the status quo – accept things as they are, there is no hope of any change. They succumb to the campaign of the ruling classes that there is no alternative to the present system and hence any attempt to change the system would be futile and fruitless. These trade unions therefore confine themselves only to the immediate issues; they do not have any long-term vision. AIIEA on the other hand is a Revolutionary trade union because it believes in the revolutionary potential of the working class. While fighting for the immediate issues of the employees like wage, service conditions, transfer, increment, LTC etc. AIIEA also imparts a long-term vision to its cadres. AIIEA has immense faith in the capacity of human beings to bring about change in the society. Invoking Rabindranath Tagore, the legendary leader of insurance employees’ movement Com. Saroj Chaudhuri had said: “It is a sin to lose faith in man. It is the man who has created all the wealth of civilisation. All the brilliant edifice that we see around the world is the human creation and creativity…..The common man, the toiling man in the mine, the toiling man in the field, the toiling man in the farm, the man in the factory, the toiling man everywhere, the man depressed, the man hungry, the man unemployed, in them all there is fire burning and one day that fire shall take the form of conflagration…please today understand that we must reinforce our conviction, we must reinforce our faith in our future.” This is exactly what AIIEA believes in – reinforcing our faith in our future. This supreme faith in the future and capacity of human beings to struggle have propelled AIIEA to undertake difficult tasks and emerge victorious even in the face of most challenging odds. Or else, how could a trade union with a limited membership aspire to challenge the ruling classes of the times and demand nationalisation of life insurance and eventually succeed in the struggle? Had it not been the supreme faith in the ultimate victory of the working class, the AIIEA perhaps would not have fought and won serious battles in the last sixty years of its glorious existence. Whether it was the struggle against automation in the sixties or the struggle in the dark days of the Emergency in the seventies or the struggle to fight out lock outs of six divisions or the struggle against the ill motivated moves to split LIC in the eighties, the uncompromising struggle for over two decades beginning in the nineties to protect insurance industry in the public sector or the innumerable struggles to secure brilliant wage increases to insurance employees have all borne the unmistakable imprint of AIIEA’s faith in the future and the revolutionary potential of the working class. AIIEA’s firm conviction in the ideology of the working class has been its greatest strength. At the same time this has been the biggest eyesore for its detractors. AIIEA is accused of being political. Yes, AIIEA believes in being political in the interest of the poor, the downtrodden, the suffering people, in the interest of the economy, society and the people at large. AIIEA believes in the politics of questioning the present exploitative order of the society. AIIEA is accused of being political because it dares to challenge and question the ruling classes. The ruling classes and their apologists want unquestioning adherence to the principles laid down by them. What about those who unquestioningly lap up whatever the ruling classes say? They do not have any problem with privatisation of insurance, they do not have any problem with job losses, they do not have any problem with the hire and fire policy of the government, they do not have any problem even if the entire range of public services are thrown open for private profit, they do not have any problem if some young boys and girls are killed in broad day light for the sin of falling in love and they do not have any problem if some innocent person is killed merely because of his food habits. AIIEA believes that this is the worst kind of politics, the politics of being apolitical, the politics of remaining mute spectators when your industry, jobs, society..everything is being torn apart. This is the politics of connivance with the class enemies. Had AIIEA not believed in class struggle and indulged in the pro people politics that has been its hallmark, insurance industry and insurance employees perhaps would not be in a position that they are in today. Of no less significance is AIIEA’s contribution to the deepening and broadening of democracy and democratic values in India. AIIEA has always been clear in its understanding that in spite of the tall talk of constitutional rights, fundamental rights and civil liberties enshrined in the Constitution, establishing true democracy is a difficult task. No right is a right if it is not put to use. Rights can never be rights by merely inserting them in the pages of statute books. AIIEA has always been of the opinion that trade union rights are the children of democratic rights; it is difficult to enjoy trade union rights without protecting democratic rights in the first place. It is common knowledge, borne out of experience, that the policies followed by the government will never permit building up of a democratic society in the real sense of the term. Once the ruling classes feel that people have started exercising their democratic rights in the real sense of the term, they will pounce upon the people for some reason or the other. This conviction of AIIEA got strengthened during the dark days of the Emergency as also during the time of the semi fascist terror in West Bengal in the seventies. The AIIEA therefore has made constant endeavour to struggle and expand the democratic rights in the course of its struggle. The political education that the AIIEA imparted to its cadres has been an exemplary blending of theory and practice. In the course of this political praxis, thousands of cadres of the AIIEA have courted numerous sacrifices and faced many a trial and tribulation. An essential ingredient of this vision has been AIIEA’s unflinching commitment to secularism and the pluralism of Indian society. Born as it was in the aftermath of India’s independence and witness as it did the gruesome killings and mayhem that followed the partition of the country, AIIEA always believed that secularism is the bedrock of Indian polity. Today the communal virus is being injected to the body politic like never before. This has vitiated the atmosphere everywhere. History teaches us that majority communalism breeds fascism while minority communalism breeds separatism and even terrorism. Unfortunately today a false sense of patriotism, bordering on jingoism, is being propagated. How can one claim to be a patriot even when selling our precious national assets at throwaway prices? How can a patriot think of protecting the integrity of India while disrupting the unity of Indians? We must make them realise that unity and integrity of the country are not mutually exclusive; these two are integral parts. We have to work ceaselessly to drive home the point that to defend the integrity of India, unity of the people is a basic precondition. AIIEA’s vision is clear as far as the caste question is concerned. It is a pity that the caste divide not only exists even after seven decades of independence, but all attempts are being made to perpetuate the system still further. The neo liberals of the economic field have no compunction in being utterly illiberal in the social field. AIIEA believes that there is no alternative to integrating the struggle against class exploitation with the struggle against caste oppression. The greatest virtue of AIIEA lies in the fact that it not only talks the talk but also walks the talk. Our comrades in Tamil Nadu have shown us the way ahead by joining the struggles against caste oppression in a big way; the Tamil Nadu untouchability eradication Front is doing a commendable work there. The Ambedkar Study centres in many parts of South and South Central zone are reflective of our units’ direct intervention on the caste question. The AIIEA has learnt with humility that it alone cannot bring about any radical change in the society howsoever pious its intentions might be. There has to be a concerted effort by all sections of the working people. There has to be a broader unity of the people. But this unity cannot come merely by preaching others. AIIEA is conscious of the fact that numerically we are a small trade union. There is no reason why bigger unions would listen to our sanctimonious talks on the virtues of unity and united struggles. The AIIEA therefore advises its cadres to do something more important and more powerful than mere preaching so that others will sit up and take note of us. That powerful and effective weapon is ‘our own struggle’. AIIEA is dear not only to insurance employees but to a large cross section of people and people’s organisations because rather than preaching we believe in setting our own examples for others to see, appreciate and join the vortex of struggle. We therefore never shy away from humanitarian interventions in times of natural calamities and other trying times. 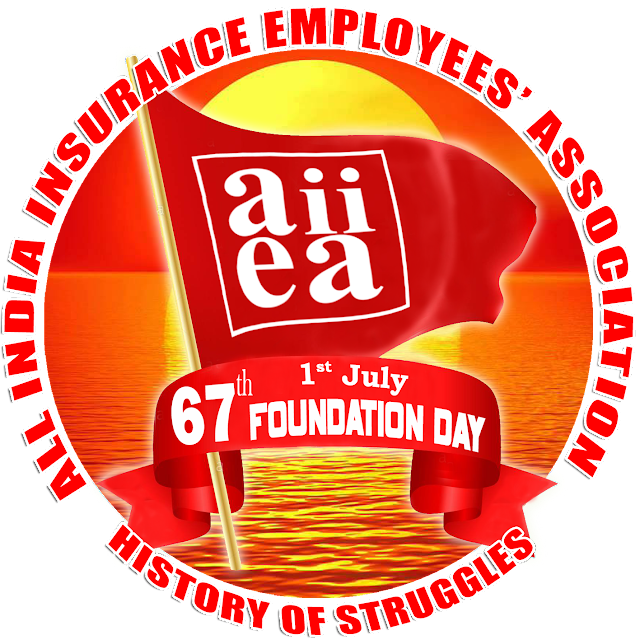 The AIIEA is therefore not a mere trade union of insurance employees. It has a vision for the people of India at large. How beautifully late Com. Saroj Chaudhury had spoken about the vision of AIIEA! To quote his immortal words: “AIIEA believes that at the end of the road lies our cherished society where the kids would not beg to stuff their stomachs, the women would not sell their bodies, the father would not desert his children and where the horizon of life would be painted with thousand rainbows and where the children would laugh and play, the men will work, the women will hum and the life will be like the petals of the morning rose wet with dews glittering in the first rays of the rising sun”. 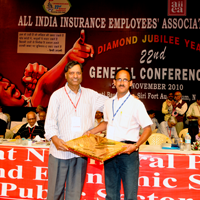 The AIIEA is not a mere trade union of insurance employees. It has a vision for the people of India at large. AIIEA’s firm conviction in the ideology of the working class has been its greatest strength. At the same time this has been the biggest eyesore for its detractors. AIIEA is accused of being political. Yes, AIIEA believes in being political in the interest of the poor, the downtrodden, the suffering people, in the interest of the economy, society and the people at large. AIIEA believes in the politics of questioning the present exploitative order of the society.